NEW YORK CITY — When your best friend is a dog, finding summer activities to do with your companion can be a challenge in the city. Luckily, summer activities like swimming, baseball and ice cream in the park are no longer reserved for those with two legs. Take your dog to Coney Island for a Brooklyn Cyclones game and dog-themed events all night long, for example. If you’re in the mood for a swim, take Fido to an indoor pool at Water 4 Dogs, where you can swim with your pet for up to one hour a day on weekends. 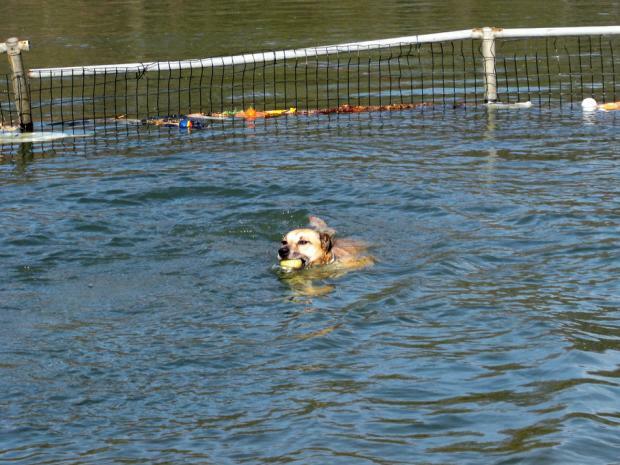 For owners looking to stay on land, Prospect Park has a Dog Beach for pups to swim and wade in during the summer. 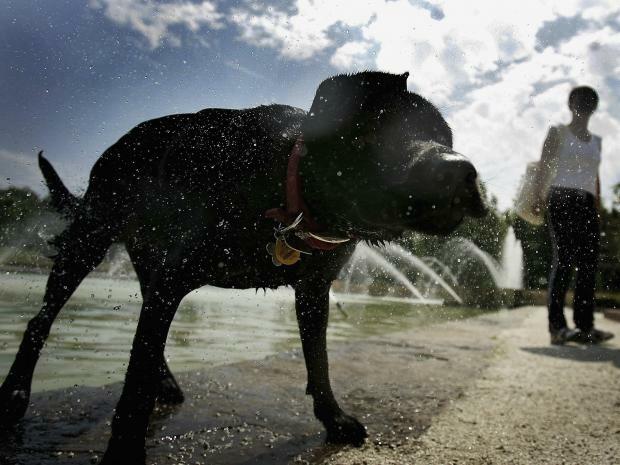 DNAinfo.com New York has compiled a list of pet-friendly spaces and events across all five boroughs to help you enjoy the rest of the summer with man's best friend. MADISON SQUARE PARK — Take a stroll through Madison Square Park with your dog this summer, visit the park’s dog run, and end the afternoon at Shake Shack, where customers can order a frozen treat for their pet. Shake Shack offers frozen treats for dogs called “Pooch-ini,” which includes shackburger dog biscuits, peanut butter sauce and vanilla custard. Bags of plain shackburger treats are also available. To top it off, leashed pets are permitted in the outdoor seating area, so you and your companion won’t have to part for the meal. Shake Shack is open everyday from 11 a.m.-11 p.m. For more information visit www.shakeshack.com. TRIBECA — Take a dip with your pet this summer at a pet-friendly indoor pool. Water 4 Dogs, a state-of-the-art animal rehabilitation center located at 77 Worth St., offers open swimming sessions that allow dogs and their owners to swim together in its custom-made indoor pool. The facility also features two underwater treadmills for canines, and an overhead lift system that can electronically carry dogs of any size to any part of the room. Open swimming sessions take place every Friday, Saturday and Sunday from 12-1 p.m., and on Wednesdays from 5:30-7:30 p.m. The price for each session is $40 for 30 minutes and $40 for an hour. Bulk packages are available. For more information, visit www.water4dogs.com. UNION SQUARE — Teach your pet how to use an iPad this summer. On Aug. 16, School For The Dogs, a company that holds training clinics for pets, is holding an iDog clinic to instruct owners on how to teach their dogs to use an iPad, iPhone or laptop. The class will teach owners how to train their dogs to target items and interact with touch-screen devices and laptops. The class will be held in Union Square, and the exact address will be disclosed to attendees after they sign-up for the clinic. The event will run from 8-9 p.m. Cost is $30, plus an online service fee. NEW YORK — Partner with your pet for a pet-friendly race through Central Park. POGO events, a company that holds scavenger-hunting events in the city, will be hosting a pet-friendly version of its Amazing New York Race on August 12. The Amazing New York Race is a four-part race that includes a scavenger hunt and an obstacle course. Participants will be given a series of clues that will lead them around Central Park, and the dogs will be tasked with performing challenges along the way. Participants will meet at Central Park’s Bandshell at 1 p.m., where dogs will be paired up into teams of two by a trained behaviorist. The cost is $35 per dog, not per person, so feel free to come with a partner of your own. Each participant will receive a doggy bag with goodies from the event's sponsors, and winners will walk away with prizes, like free doggy day care. For more information, visit www.theamazingnewyorkrace.com. To register, visit ardog81212.eventbrite.com. PROSPECT PARK — The Dog Beach, an enclosed pool area in Prospect Park near the Tennis House, provides enough space and water for dogs to swim and wade this season. Owners should always have control of their dogs, noted Ipcar, as the dog beach can get crowded during warm summer mornings. The Dog Beach is open during off-leash hours at the park, which run from when the park opens to 9 a.m. and from 9 p.m. until when the park closes. For more information about the Dog Beach, visit FIDO at www.fidobrooklyn.org. For more information about park rules concerning dogs, visit www.nycgovparks.org/facilities/dogruns. BROOKLYN HEIGHTS — Enjoy a wine tasting and watch your new puppy socialize with other pups of the same age. Wag Club, a pet care center located at 362 Furman St., is offering a weekly program called “Wine n Puppies,” where young puppies can learn basic commands from trainers and socialize with other puppies, while their owners enjoy a complimentary wine-tasting by Waterfront Wines & Spirits. Puppies must be under 4 months old to participate, as it is the optimum socialization period for a puppy’s life. Using reward marker training and positive reinforcement, trainers will teach the young pups essential commands such as Focus, Sit and Take It. Owners will also learn tips on house training, feeding, nipping chewing, begging, jumping and barking. "The critical period when puppies form opinions about the world is between week three and 16 weeks so it is crucial to expose them to a variety of experiences as early as possible in order for them to grow up to be well-adjusted adults," said John Squires, owner of Wag Club. Each class is $15. Consult with your vet regarding vaccination requirements. Wag Club highly recommends that your puppy is on his or her way to receiving two rounds of shots for Distemper/Parvo and Bordetella. For more information, visit www.wagclubny.com/WAG_Club/Home.html. CONEY ISLAND — What’s a better way to spend the evening than at a ball game with your best friend? On August 22, the Brooklyn Cyclones will be playing against the Tri-City Valley Cats and will be holding a special Bark in the Park event, which allows you to bring your pet to the stadium for dog-themed events all night long. Special Bark in the Park events include a frisbee chasing performance, puppy parade, and a doggy wedding. An adoption center will also be available. The stadium is located at 1904 Surf Ave. and the event takes place from 7-11 p.m. Tickets are $10 and includes one human and up to two dogs. Proceed benefit the Mayor’s Alliance for NYC Dogs. For more information, visit www.animalalliancenyc.org/events/featured/barkinthepark/index.htm. LONG ISLAND CITY — Bring your pet along to the next happy hour. Long Island City Bar, located at 45-58 Vernon Blvd., is a casual bar with barbecues and live music during the summer, but the icing on the cake is the pet-friendly patio in the back. The patio features a large willow tree for plenty of shade for you and your pet on hot summer afternoons. Local musicians perform at the bar on Sundays during the summer and Quiz Nights are held on Thursdays throughout the year. For more information, visit www.licbar.com. PELHAM BAY PARK — Explore the salt marshes, forest, meadows and shorelines of Hunter Island with your four-legged friend. Hunter Island’s trail offers a 2.25-mile hike that will take about one hour to complete with your dog. Keep a nose out for rising tides as you cross through the salt marshes, and be sure to pack mosquito repellent. All dogs must be on a leash no longer than 6-feet long. For more information, visit www.nycgovparks.org/parks/pelhambaypark/highlights/11859. PORT RICHMOND — Taking your dog to the movie theater is quite impossible, but that’s the great thing about summer, now your pooch can accompany you to a movie in the park. On Aug. 17, take your family, including your pet, to a movie at CPL Thompson Park for a free screening of "Kung Fu Panda 2." Although your pet will have to stay on a leash, he’s welcome to snuggle on the picnic blanket with the rest of the family. This event is free and the park is located at Broadway and Henderson Avenues. For more information, and a list of free movies city parks this summer, visit www.nycgovparks.org/events/free_summer_movies.